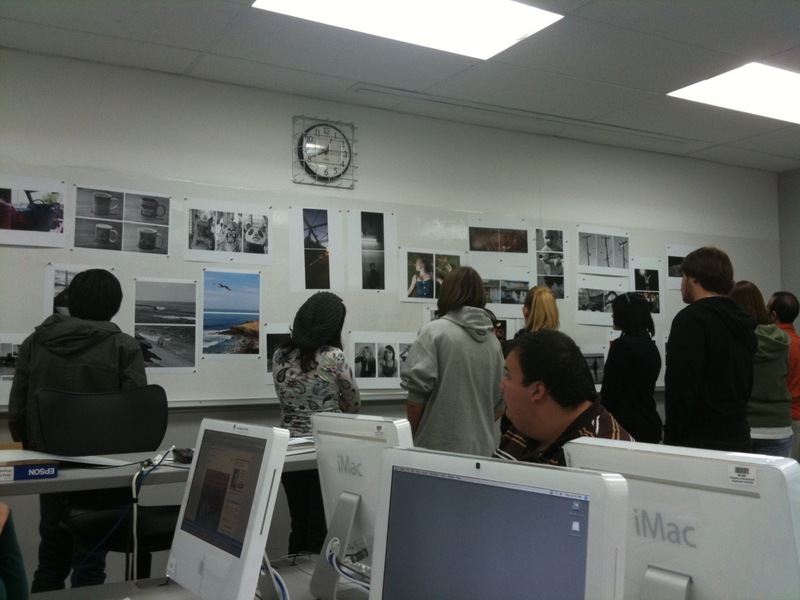 Each time I complete critique evaluations, I think about the education of a photographer. I wonder about how they’ve arrived at the work that was pinned-up on the wall and after it’s all said and done, how they proceed with their photographic practice. Basically, students are asked to “shoot images that reflect focused attention on their curiosities and interests through their photographic vision and sense of technical execution and craftsmanship in preparation for developing a conceptually cohesive group of photographs” and that their “idea(s) reflect a sense of considered thought, active visual exploration so as to identify a vision and voice.” For the critiques, the work is pinned-up of each individuals’ working process, including contact sheets, edited contact sheets and/or prints, to assess and critique. What transpires during critiques is particularly interesting, enlightening and at times even troubling. The individual working processes that end up on the wall for everyone to evaluate and critique range from tremendously engaged practice with the wall full of work that suggests tremendous possibilities to what is minimal effort at best. While I suppose this is to be expected within the structure of academia and the education of a photographer, this is also particularly curious and unsettling. I might suggest the role and function of a critique and subsequent criticism within such a context is to put the work, and in this case, the working process, through a crisis – basically, to subject the maker’s efforts through careful analysis and consideration, exposing not only what is conceptually and visually engaging, but equally, its shortcomings. It is the necessity of a critical distance by the maker and their audience to evaluate the work and its process of being made with informed examination and scrutiny. The critique and criticism is not necessarily intended to be constructive as it is instructive, not only for the maker, but equally for the participants. Particularly within this context, it becomes imperative to relinquish ones infatuations of their own work, as well as the work of others, and focus attention on what conceptual, aesthetic and technical considerations need to be further developed and incorporated for the work to have a chance of becoming vital and engaging. I don’t think that commitment is an optional thing for the creative person. I think it’s an indispensable thing. In one form or another, only commitment can rescue us from boredom and frustration. This leads to the sense of commitment that all practitioners in the medium, professionals, teachers and students, must develop within own their creative visual practice in order to sustain it in a productive and meaningful way. We all have things we have to do or need to do, such as work at jobs to take care of the necessities of our existence. And then there are the things we want to do and/or like to do, such as engaging in photographic practice. We may not know necessarily know why we’re so profoundly drawn to this means of visual expression, but somehow, we become hooked and eventually pursue it with a greater need of purpose. At some point, this desire to want to do something because we like to do it becomes something we need to do. Such a need demands the utmost commitment of ourselves to it, without hesitation or excuse, as if some part of our existence depends on it. However, with that said, it’s only photography and maybe for some, it’s not something that needs to be done.